In every Air Conditioning Unit we required the a Compressor .Compressor plays an very important role and it is a heart of Refrigeration cycle. It Compress the refrigerants and then these compressed gases gets heat up and leads to raise the refrigerants pressure. Once heated, the gas leaves the compressor and goes into the condenser so the cooling process can begin. While all AC compressors have the same job, they work in varying ways and offer different pros and cons. The external-drive compressor has a crankshaft that is driven by a pulley and belt system.An electric motor can also be used to drive it directly. The hermetic compressor has a motor which is sealed inside a housing with the compressor, hence a crankshaft seal is not required. The motor rotor is located either at the top or bottom of the unit. 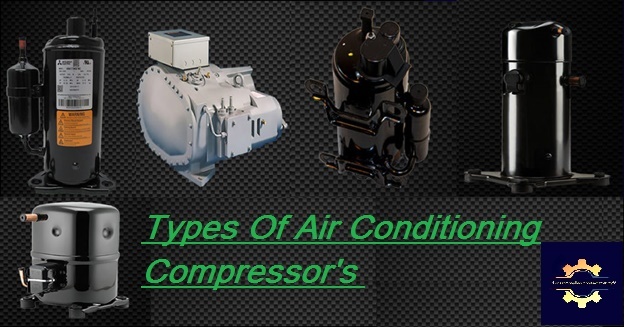 Essentially there are 5 different types of AC compressors that work in slightly different ways. We will explain each type in greater detail to help you better understand how your AC works. It is the most widely used compressor.It uses the piston driven in cylinder by crankshaft .Suction and discharge valves are thin pates which open and close easily.The refrigerant is sucked into the cylinder by a vacuum that is created as the piston moves down. When the piston moves back up, it compresses the gas, which is then pushed into the condenser. Reciprocating compressors are very efficient and you can get AC units that have 2, 4, or even 8 cylinders in its compressor. Centrifugal compressor is usually used in large capacity refrigerating system. Because it is unique in that it uses centrifugal force, it has very few moving parts (no valve, piston, cylinder, or blades) and is highly reliable and efficient especially at higher speeds.In this compressor, the vapor is moved in a circular motion known as centrifugal force. An impeller which is a disk with radial blades spins rapidly inside this housing causing the gas to gain velocity. A diffuser converts this energy into pressure energy and is then discharged into the condenser. The pumping efficiency increases with speed, hence this type of compressors are designed to operate at high speed. The screw compressor is extremely reliable and efficient, but it is mainly used in large buildings where there is a vast amount of air that requires continuous cooling. The screw compressor uses a pair of helical rotors where it traps and compresses the gas as the rotors revolve in the cylinder. As the refrigerant moves through the compressor, the space gets smaller, and it gets compressed.In HVAC, they are usually used in systems with 20 ton capacity and above. Scroll compressors are becoming more popular for use in HVAC systems as they are more reliable and efficient than reciprocating types. This is because they have fewer moving parts than in reciprocating compressors. It has one fixed scroll (it looks like a coil or spiral) that remains stationary and second moving or orbiting scroll that rotates through the use of swing link. As the second scroll moves, pockets of refrigerant between the two scrolls are slowly pushed to the center, compressing the refrigerant. Rotary compressors are usually very small, quiet, and reliable.The rotary compressor can be divided into two types. One has blades or vanes that rotate with the shaft. The other type has the blade which remains stationary and is part of the compressor housing assembly. In both types, the vapor from the suction line is drawn into the cylinder through the suction port. As the blade rotates, trapped vapor in the space ahead of the blade is compressed into high pressure gas after which it is discharged to the condenser through the exhaust port. The number of blades can range from two to eight in a single system.